Drawing a Line on Compassion | Julie O'Neill Photography. I have often been asked, “why animals?” It seems that some assume that those caring for animals care “only” for animals. This is not the case with many of the wonder­ful people that I have met over the years. In fact, most of the compas­sion­ate people that I meet do not restrict their compas­sion to only one direc­tion. I have met so many people who are working to save animals as well as helping people and vice versa. My answer is always that there is no limit to compas­sion. My involve­ment in helping animals has given me the confi­dence to broaden my involve­ment in helping in general. Compas­sion does not have to be bound to only one cause or one direc­tion. Giving is conta­gious and the more one gives the more one’s heart will grow, making room for only more giving. I came across a perfect example of a human being that knows no limits to compas­sion in Nanning, China. 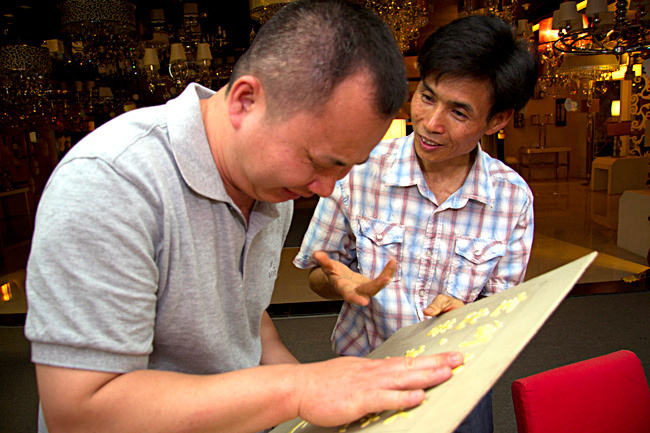 As a young man Mr. Zeng was an artist and making a living through paint­ing tradi­tional Chinese art. He had already estab­lished himself as a talented and success­ful painter as a teenager, but he was driven to do more and to use his talents as an artist to help others. 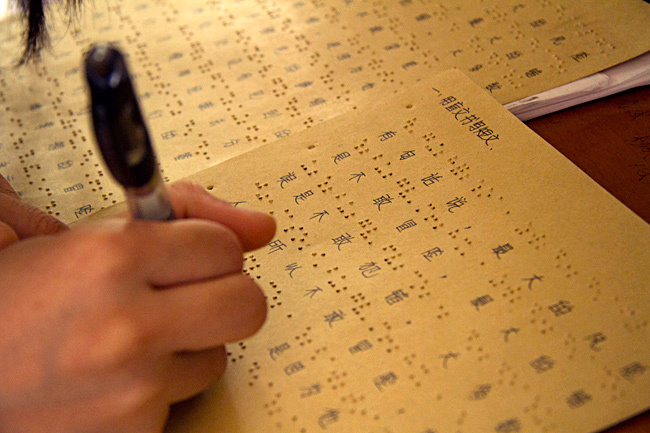 In China those with disabil­i­ties are often viewed as unable citizens and are removed from society and insti­tu­tion­al­ized. The disabled are usually removed from any formal educa­tion, normal society and their families. 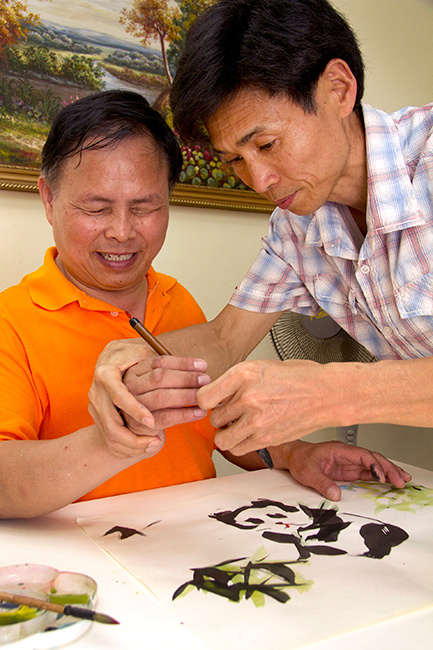 At the age of 20 Mr. Zeng met a blind man that surprised him with his knowl­edge and capabil­ity to distin­guish colours by touch and temper­a­ture alone. 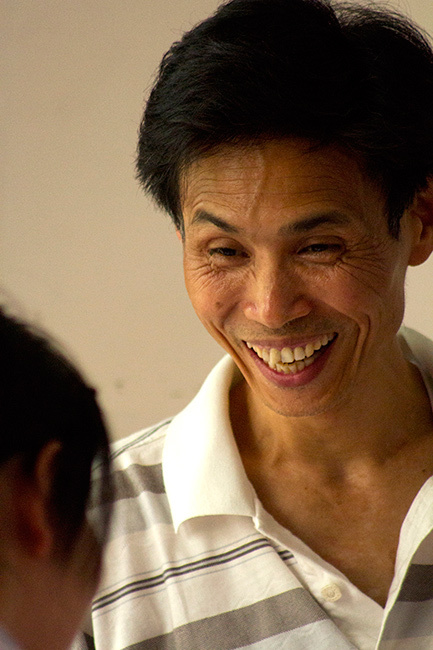 The fact that the blind find other ways to see was a new concept for him and sent Mr. Zeng onto a new path. He set out on a crusade to show the world the capabil­i­ties of the disabled. He decided to use his skills to teach the disabled how to paint. He entered hospi­tals and insti­tu­tions that housed the disabled and contin­ued to learn just how wrong stereo­types placed upon the disabled were. He found creative souls that were yearn­ing to learn and to express themselves. 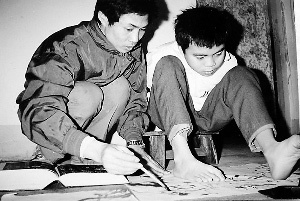 In his thirties Mr. Zeng was inside an orphan­age for disabled children teach­ing them art. 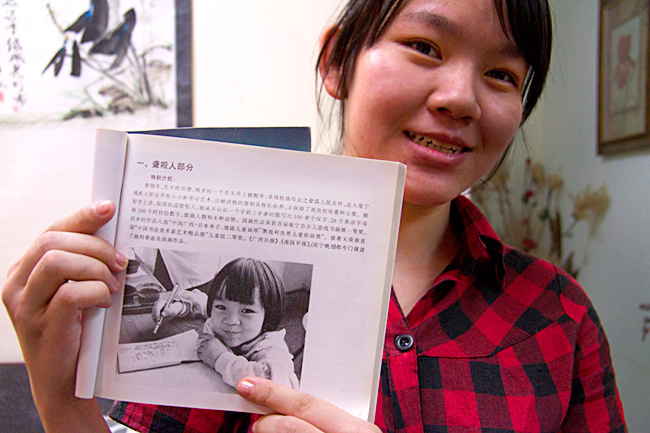 A young deaf girl named, Yujun, partic­u­larly moved his heart. She had no family and no hope for a future life outside of an insti­tu­tion. She loved art and showed incred­i­ble talent under Mr. Zeng’s guidance. Within a short time Mr. Zeng adopted young Yujun as his daugh­ter who today shares the joy that Mr. Zeng receives by helping others. 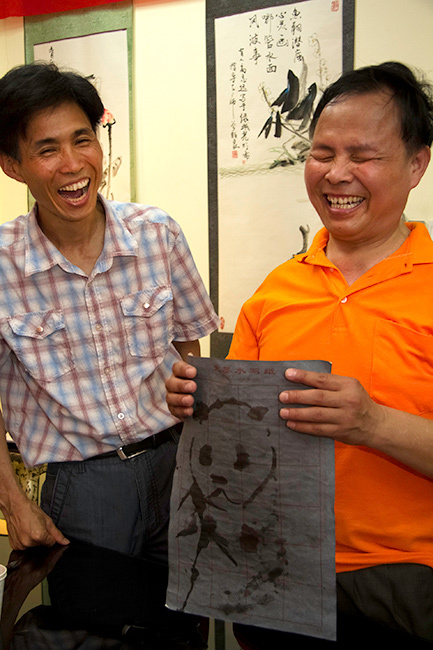 Today at the age of 54 Mr. Zeng contin­ues to teach art to the disabled as well as teach­ing others how to do the same. 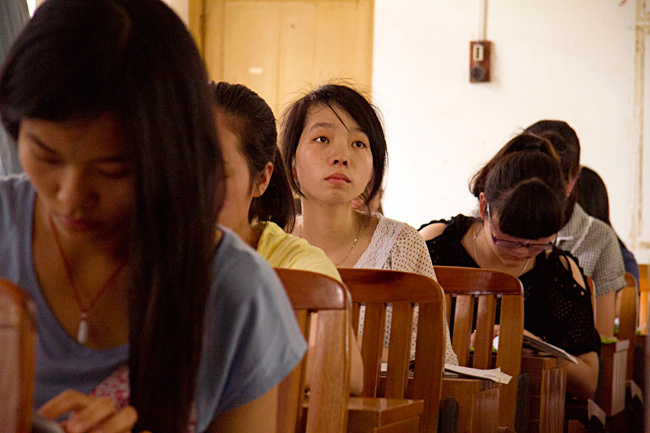 At a univer­sity in Nanning he teaches a course on special educa­tion. He teaches his students the skills that they need to commu­ni­cate with the disabled as well teach­ing them to become respect­ful and compas­sion­ate teach­ers themselves. While having dinner with Mr. Zeng it didn’t surprise me to learn that he is a vegetar­ian. He told me a story of himself as a young boy who was forced to witness a chicken being killed for his next meal. Mr. Zeng said that it broke his heart to watch an innocent animal loose its whole life for him and he has refused to eat animals ever since. I took the oppor­tu­nity to explain the animal cruel­ties that are also involved in egg and milk produc­tion. Mr. Zeng had never heard of “vegan­ism” and was unaware of the suffer­ing involved in creat­ing these animal products for our consump­tion. Mr. Zeng simply replied, “I too shall try this lifestyle”. My days spent with Mr. Zeng were inspi­ra­tional. He is an example of a compas­sion­ate heart that knows no bound­aries. His bright smile and positive energy makes all of those around him want to be and to do better. The wonder­ful Mr. Zeng has many more plans for his future and intends to continue caring and sharing as far and wide as he can, in every direction. 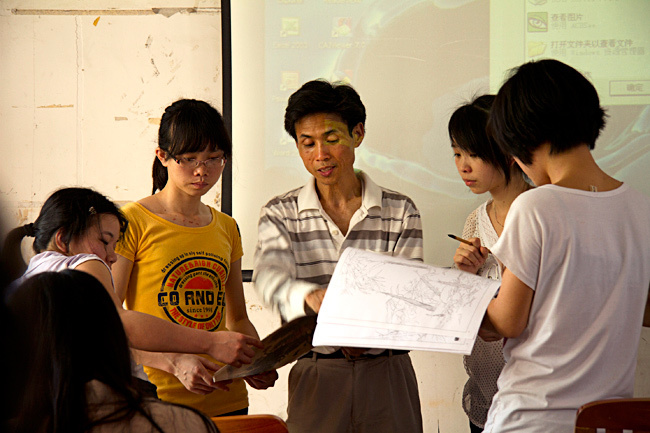 Thank you for bring­ing atten­tion to Mr. Zeng’s wonder­ful work through your blog. In today’s world, so many individ­u­als admire sports stars & TV/movie actors when instead their admira­tion should go to people like Mr. Zeng. Barb, I totlally agree with you, thank you for making such an excel­lent point! Julie, WOW what an awesome & inspir­ing share!!! THK U 4 all your Love & Compas­sion in sharing incred­i­ble ppl & animals from your Amaaaz­ing travels & work to Assist those in need. I agree — Animal Advocates & Rescuers are indeed some of THE MOST Compas­sion­ate Souls on this Planet & their hearts reach out to help BOTH Animals & Humans & Mother Earth. We LOVE doing cat rescue work here in Toronto & get SO much back Anytime we assist people or animals in need, it’s truly a Win-Win-Win for ALL involved!